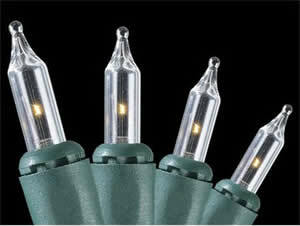 We have all faced the frustration of replacing a mini bulb, as shown in Figure 1, in a string of Christmas tree lights. If you are like I am I have a variety of mini bulb light strings that I purchased over a number of years and a zip lock bag filled with replacement bulbs. I have been smart enough to only purchase mini bulb light string sets that operate even if a bulb is burnt out. However, replacing that one burnt out lamp can be a bit of a nightmare because there are different voltage lamps and some have identical bases. Placing a lamp of a different voltage than that which is required will not correct the burnt out lamp problem. You should also follow these guidelines when replacing mini bulbs. Identify the burnt out lamp and then unplug the set before changing the lamp. Do not try to pull the lamp out of the socket by grabbing onto the glass portion of the lamp. Always pull the lamp by gripping the plastic base that sits above the socket. Do not try to remove the lamp by twisting it. All mini bulbs are designed to go straight into the socket. Always replace burnt out lamps promptly. A mini bulb string operating with less than its full capacity of lamps lit puts undo electrical stress on the lamps which are still lit. Note: Clear lamps with a red tip generally indicates a flasher lamp. This lamp makes the mini bulbs flash on and off. If you want your lights to flash on and off simply replace any lamp with the lamp that has a red tip. Sets of mini bulbs that have more than 50 lamps may be constructed as two separate sets. This means that you will have to replace two lamps with red tipped lamps in order to have the entire set go on and off. The two sections will not flash in unison.